If you were anywhere near Old Town Fort Collins last weekend, you probably found yourself grooving to the music of acclaimed artists, spinning on the dizzying tilt-a-whirl, or sampling the wares of the hundreds of vendors that lined the normally quiet streets. This is New West Fest— the annual, all-encompassing music festival sponsored by Downtown Business Association to celebrate the city’s birthday. Every August the people of Fort Collins flood Old Town in honor of the city they call home, and as active members of the community, the Drive Electric Crew was there too! If you attended this year’s festival, you may have noticed the Cadillac ELR at the DENC tent, courtesy of Dellenbach Motors. 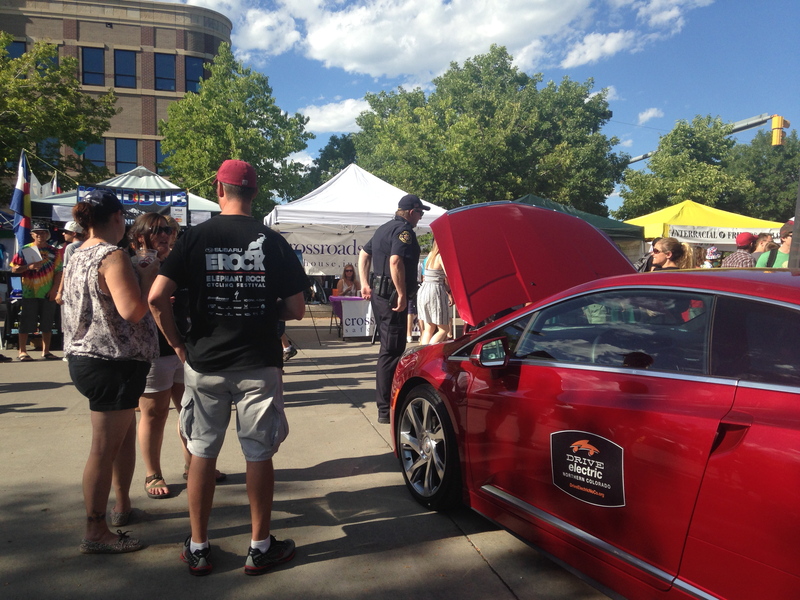 As part of Drive Electric Northern Colorado’s efforts to promote and educate about the benefits of electric vehicles, event guests had the opportunity to explore the ELR and were encouraged to ask questions about EV technology and the variety of models available in Northern Colorado. DENC also had plenty of information about EV charging infrastructure advancements in the region. Joined by local EV owners and enthusiasts, there was a lot of discussion at the tent about owners’ experiences, and a fun EV game that challenged the EV IQs of adults and children alike. Over 800 people have driven an EV at a DENC Ride-and-Drive event. DENC is always excited to participate in community-wide events such as New West Fest because they give us the opportunity to meet and connect with a variety of people who share our passion for electric vehicles and the benefits that come with driving an EV, such as decreased vehicle emissions, increased national and economic security, and advancing technology innovation. It was our pleasure to spend this two-day event engaging interested members of our community and helping them determine which model of electric car fits their family best. If you didn’t get the opportunity to join our growing family of Electric Vehicle Enthusiasts this weekend, check out our website or join the Meetup group to find out how you can learn more about this exciting technology!